If you suffered from a cold or flu during the winter of 2017, then you weren't alone: it was the worst outbreak of flu on record, and it's feared that 2018 may see similar numbers. Dr Cris Beer shares her dietary advice on how to stay well this winter. A strong immune system – your defense system which helps fight colds and flu – begins with your diet, which is why I recommend the following foods to help support your winter health. The vitamins A, C and E are all antioxidants, which are found in various foods, and can help support your immune system. 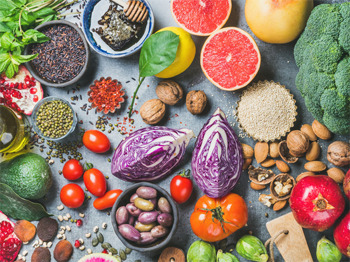 Antioxidant rich foods include leeks, onions, garlic, pumpkin, cruciferous veg, such as broccoli and cauliflower, lentils, tomatoes and herbs including thyme and oregano. Vitamin C, also known as the classic immune-friendly ingredient, can be found in a number of seasonal fruits, such as kiwi fruit, blueberries and of course the humble orange. My advice? Keep your diet as rich in lean meats, and seasonal fruit and veg to ensure you're covering the antioxidant bases. Herbal teas or a cup of hot lemon water is not only a simple and effective way to stay a little warmer in the colder months, but can also be a great way to stay hydrated. If you're looking for that extra boost, try adding ginger or honey. I mean zinc of course! Zinc is a must-have mineral for immune function. It has often been used to support healthy skin and eye health. If you are deficient in zinc, then your body may not be performing at its best level. A diet rich in zinc includes these foods: red meat, poultry, beans, nuts, oysters, crab, whole grains and dairy products. There is a lot of interaction between the immune system and the gut. There's around 70 per cent of the cells which make up your immune system residing in your gut wall, and keeping these in balance is believed to go a long way towards maintaining good health. Good gut health may help you with winter illnesses, so consider including probiotic-rich foods such as yoghurt, sauerkraut, or miso to your diet.